Every March in the US brings a bit of crazy to the workplace. The NCAA march madness tournament begins. This one and done competition has become a big focus of both all types of sports fans. Even people who don’t usually care about sports will fill out a bracket in their office pool. If you don’t know about the tournament, it starts with some play in games but gets set with 64 teams all trying to win the national championship for college basketball. The great part of the three weeks is that sometimes David does slay Goliath. The other big part of the season is that tons of people fill out a bracket in an attempt to figure out who will win what game and advance to the next round. Points are given, and dollars exchanged. It does bring an office together. However, as I no longer fill out a bracket and do the office thing, I did start to wonder could all the hype of the NCAA tourney be brought back into our creative practice. 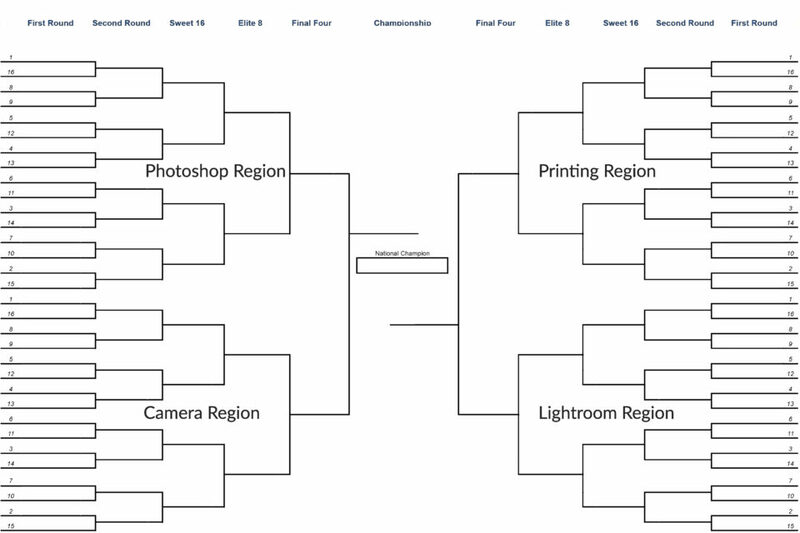 This week’s podcast is about how to use the craze and hype of bracketology to help us better our photograph and visual literacy. The first game is to select your 64 best images and put them into the bracket, and run images head to head to find your best. Remembering that it is a seeded tournament, so you have to break apart your one seeds from your two seeds. Upsets occur all the time to a 16 seed can beat a one seed. Second, you can list out your 64 biggest issue you have with your photography no matter how big or small and then use the bracket to help you narrow down your focus to only what needs your attention. Your final four eliminates 60 other things you think you need to focus on but can likely let go. Feel free to download the empty bracket to get you started.